With the new flagship of the IMPRESSA S range, cappuccino and latte macchiato are prepared at the touch of a button, without you having to move the cup. With its elegant platinum styling and upgraded design, this high-quality product is fully in keeping with contemporary trends and exudes superiority, solidity and competence. It impressively demonstrates these attributes with each coffee speciality that you enjoy. In addition, the IMPRESSA S9 One Touch actively assists you in saving energy. The new IMPRESSA S9 One Touch will thrill you with cappuccino or latte macchiato prepared at the touch of a button, without you having to move the cup. 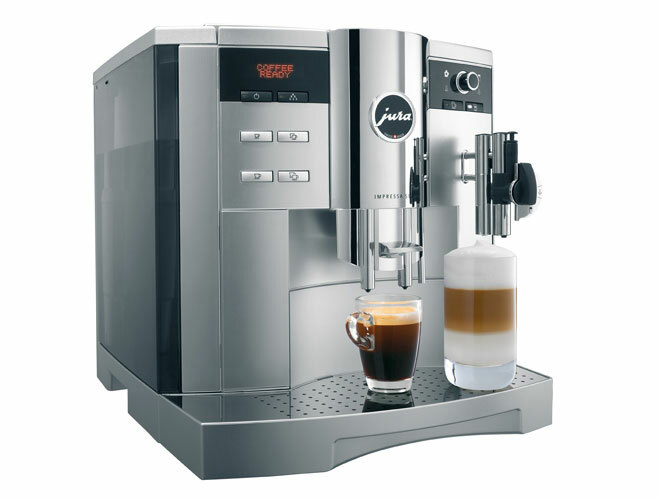 The IMPRESSA S9 One Touch flatters the palate with coffee à la carte in all conceivable variations. Depending on whether you would like to enjoy a ristretto in a small cup or a latte macchiato in a glass, you can adjust the coffee spout from 66 to 146 mm. Active bean monitoring puts an end to problems with grinders running empty. The filling level of the bean container is continuously monitored optically. WE PRICE MATCH - If you see this machine cheaper or are offered a lower price, let us know we will beat it call 0800 321 3357 or email. The digital assistant LEO will teach you all about the Jura S9 One Touch. Get to know the machine before your buy!